I just finished a clinic for kids in Hilbert WI and we all had a great time! 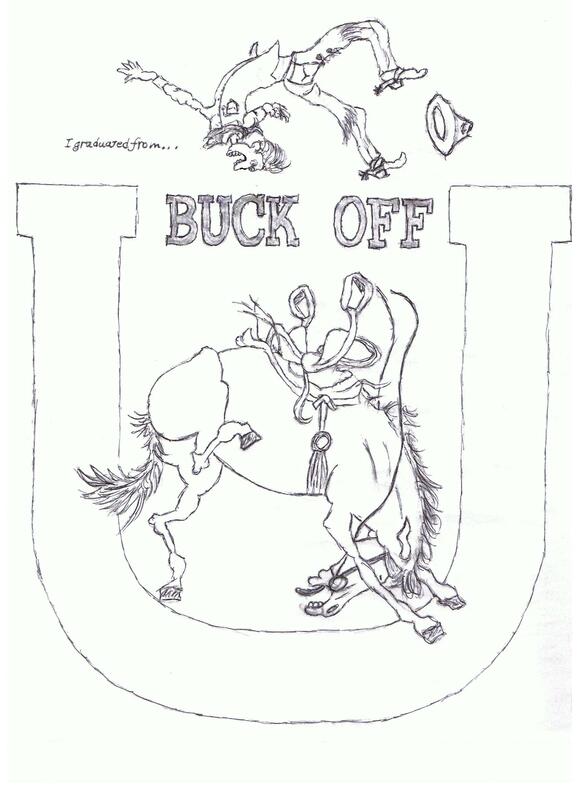 I think everyone learned a little something and no one graduated from “Buck Off U”! For those of you that were in the clinic or auditing please send me your comments and let me know what you thought.. You can also comment right on here if you like. Thanks for having me and have a great summer! Here’s a little something about how I look at fathers day.. Perhaps you will like it. One of my most important teachers and mentors is one very special horse woman. She is not a famous trainer or an all knowing horse guru. But she is one of the most knowledgeable people on this planet as far as I am concerned. She grew up in the city and moved to a ranch and knows her fair share about horses mind you but to become a true Master of Equiknowlogy it takes Just a Bit More Knowledge which she has in abundance. to help others down the road of life they are pavin. But perhaps add to her family of critters and the kids pics on the wall. Its the lessons of life and how to behave, and just keep on learning most every day. And say youre grounded my son, now off to bed! I’ve been pretty busy these last months starting colts and helping folks with their horses. But occasionally things happen that makes things difficult and dangerous for those of us that work with other folks horses.. One such case is the horse I just sent home. This horse came in for a restart after he displayed a marked change in his attitude. with rearing up, bucking, not taking the bit etc. Most I thought was probably just bad manners and habits and not getting the proper start in the first place. However…. That was not the case. Turns out that this horse had numerous physical and mental problems associated with conditions the owner ether knowingly or not, left out when she described her horse. She did mention that this horse had Lyme disease and Anna Plasmosis last year which could contribute to his problems but the one she left out was that this horse had EPM before that.. Had I known that I probably wouldn’t have even gotten on this knot head in the first place, and explains a number of his physical and mental problems. Please folks, be honest with your trainers and tell them everything about your horse. We take a risk for you by just getting on your horse and trying to fix the problems your having or help make him better. We don’t want to unknowingly get on something that could very well be very dangerous for us and him based on his physical and mental problems. Sometimes horses just can’t be fixed and it’s to dangerous to try.. This was one of them, and I got busted up trying because his issues were from something that none of us could have fixed. Luckily, I will heal up but its getting harder at my age to do it fast and when your charging 10 bucks a day to get on something the owner doesn’t want to get on, it aint worth the trouble.. Read my books and go get yourself a good horse and we will both be better off. Have a good one and “Just Ride”! I just wanted to let you know that I did a radio show this morning for the show “Horses in the morning” It should be in the archives soon so drop by and take a listen! I very much enjoyed chatting with Glen and Jammie and they have a great show! I got a phone call from Rusty’s wife today and It’s looking like my friend and brother is on his last ride to meet the old man… I wish there was some power or wisdom I could muster up to change the realities of life and death but as true horseman know, all things happen for a reason an its up to us to figure out how to see the problem at hand and deal with it in the best way we can… with the knowledge and experiences we have learned through life with horses and people. My friend Rusty was not a famous horseman or person of noted fame and fortune. He was just a man living life the best he could and trying to make life better for those around him. He gave of himself without regard to who’s gaining from it, how much money he could make, or who might get the credit. His knowledge and wisdom will not go down in the annuals of training history or be eulogized in a nationally televised memorial. But My friend was every bit as important to the folks he helped and those that knew and loved him as a friend as any one of the big time personalities that people idolize today. He is the true measure of a man and a horseman, and I hope I can carry on in his absence.. Have a good ride my friend and we will we see you in another pasture some day. I received some good news today! My first book Whisper This… has been picked up by a publishing company for reprint! This means a lot more opportunities for exposure and hopefully being able to help more horse folks out there.. The bad news is, the current addition will be pulled from the market very soon in order to to make way for the new publisher to re release the book. I am not sure when this will happen but if you are thinking of picking one up I would suggest that you do not wait! The new one might not be out until after the first of the year. I hope you are having a great fall and we will see you around the pen! Well fall is just around the corner and it will soon be time to break out the winter jackets. Its been an up and down year here at the spread but as anyone into horses knows that’s par for the course.. As you know my new book Equiknowlogy 101… came out the 1st of July and the review from all books was very positive. But due to the fact that I do not garner the national attention that some writers enjoy, sales have been slow up to now. The Western Horseman declined to review my book siting some nonsensical excuse but more likely because they like most everyone in the horse business are more interested in what sells or is most popular at the time, not what folks need to hear or might like to read. Of course that’s just my opinion though and like the rest of the world everyone has one.. That aside, I am hopeful that some folks might like to pick it up and if it helps someone stay out of trouble and enjoy the equine experience a little bit more and a little safer, then it was worth the time to write it! Two weeks ago I lost my round pen, the roof on the house, some of my fences and a few tress to the tornado that rolled through our area. So I’ve been busy trying to get things back in order from that. But no one was hurt, the critters survived and some of my neighbors fared far worse so I consider myself lucky. Like I said its not always a piece of cake in the horse world or in life so buck up enjoy the good things you have and forget about the rest! If anyone is interested Google books has a look inside feature of Equiknowlogy 101… so you can take a look at some of the chapters there. Amazon will hopefully have it up as well shortly. If you are on face book you can go to my horseman’s services page an watch a short clip of my colt starting video too. One high point last month is that my round pen video seems to have had a surge of interest.. I’m not sure why but if any of my friends out there have seen or know-of any reason why please drop me line. I always like to hear about how folks found it, buy it, like it or not, so I can improve on the next bit of drivel I put out to hopefully give you a little knowledge and enjoyment! For now that’s about the all the news from our neck of the woods. Drop in and say howdy once in while and let me know I’m not alone out here in web world!